cell culture supernates, serum, plasma(heparin, EDTA)and urine. 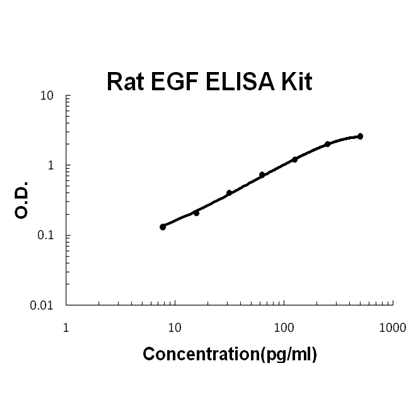 Sandwich High Sensitivity ELISA kit for Quantitative Detection of Rat EGF. 96wells/kit, with removable strips. EGF stimulates the growth of various epidermal and epithelial tissues in vivo and in vitro and of some fibroblasts in cell culture. Magnesiotropic hormone that stimulates magnesium reabsorption in the renal distal convoluted tubule via engagement of EGFR and activation of the magnesium channel TRPM6 (By similarity). .
Epidermal growth factor(EGF) is a growth factor that plays an important role in the regulation of cell growth, proliferation and differentiation by binding to its receptor EGFR. EGF locus is mapped to 4q21-4qter. Human EGF is a 6045-Da protein with 53 amino acid residues and three intramolecular disulfide bones. EGF results in cellular proliferation, differentiation, and survival while plays a physiological role in the maintenance of oro-esophageal and gastric tissue integrity.